Orange Beach Alabama waterfront estate for sale. This Spanish style resort residence offers the best of Gulf Coast living – constructed in 1981 on 100′ x 1000′ tree covered property on Bayou Saint John. The home’s entry features double front-doors that leads into the expansive living/dining area, beamed ceiling, a raised hearth fireplace, arched windows and a door lead out to the sunroof, also with arched windows that look over lovely raised patio with center fountain onto the massive oaks that canopy over lawn. There is a bulkhead, with white-sand beach, pier and boathouse and exceptional views of Bayou St. John. Split floor-plan with the master bedroom and bath, guest bed and bath on opposite sides of the house. The kitchen/breakfast area, laundry and pantry are all spacious and comfortable. The guest house which is across the courtyard from the main house, consists of a very nice living area and kitchenette, bedrooms 3 & 4 and a third bath. You have to see this home! Orange Beach has numerous public parks and boosts the largest charter-fishing fleet in the Gulf of Mexico, it is the easternmost community on Alabama’s Gulf Coast. 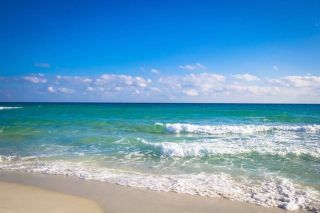 Orange Beach offers miles of white-sand beaches – the interior bays and bayous just north of Perdido Pass provide for an array water-sports and outdoor activities.